Chaos is inevitable—especially when you spend all day in a classroom. Between taking attendance, collecting homework, and the hundred-and-one other daily routines that teachers endure, there’s a lot of room for things to slip through the cracks. With that in mind, we’ve come up with some must-have items for classroom organization. Say no missing coats, lost homework and misplaced backpacks! A bulletin board may not seem like an organizational powerhouse. But when you take into consideration the fact that teachers are as busy keeping track of their students as they are graded papers and classroom supplies, a bulletin board gains a whole new appeal. The great thing about bulletin boards is their versatility. You can post the seating chart, feature student art, hang attendance slots and disciplinary charts, and generally morph a small section of wall real estate to your unique needs! For some fun and unique takes on how to use bulletins boards in your classroom, check out these ideas from Education World. Yawn, shelves to put books on—how drab. That is, until you realize that something’s name doesn’t necessarily define its purpose. With a touch of creativity, you can use a bookcase for everything from showing off your geode collection to collecting/passing back homework. Shorter bookcases can also be used to delineate separate learning spaces, as discussed in our blog on the topic. The great thing about bookshelves is that they come in many shapes and sizes! You can dominate a wall with a multi-purpose cabinet, show off your class’s literary ensemble in a snazzy book display, or take advantage of an empty corner with a space-saving corner storage unit. It’s up to you! A lot of classroom supplies disappear over the course of a school year. You’ll often find these missing items in stuffed in random corners and unmarked bins during the end-of-year cleanup. Skip the year’s end hide-and-seek game with color-coded storage bins! Incorporating something like our 15 Drawer Mobile Organizer into your classroom is a good way to ensure things get put back where they belong. You can even make a game out of it! If you have a rotating list of weekly duties for your students (e.g. line leader, paper distributor, etc. ), create a new position: school supply detective (or something of the like). Alternatively, assign each student a drawer to keep track of! Whatever you choose to do, clearly marked storage bins are a massive boon for keeping your classroom in order. It may seem silly to have a designated storage spot for students’ backpacks. After all, backpacks themselves are for storage! But after your fourth time tripping over Timmy’s backpack straps or being interrupted by some peckish student fumbling through their lunch bag, the appeal of cubbies becomes more apparent. After all, it’s hard enough to keep the classroom in order when students aren’t strewing their personal effects about at random. The same goes for lockers—if you teach in a climate where students often wear outerwear, having a handy coat locker by the entrance can save you a lot of clutter throughout the year. 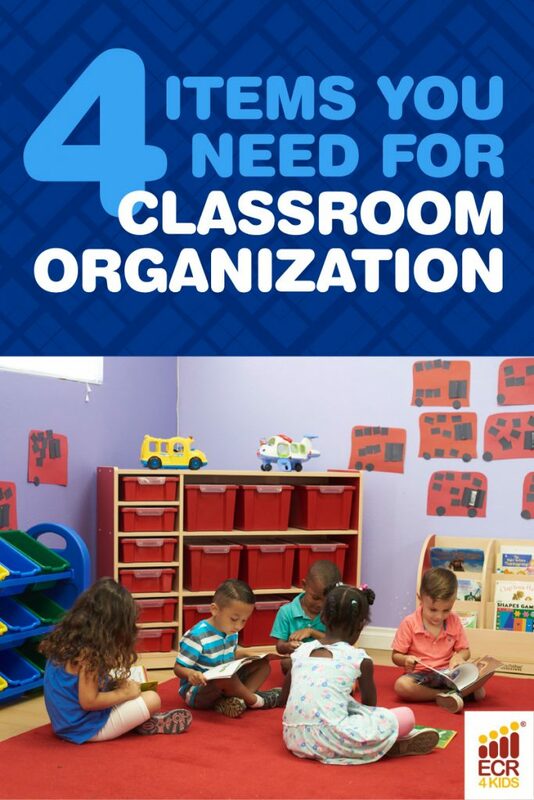 With these four classroom items at your disposal, things will practically organize themselves! Teachers, what items help you keep track of your classroom’s plentiful goings-on? Let us know on Facebook or in the comments below! And don’t forget to follow ECR4Kids on Facebook, Pinterest, or our blog via email for more of these posts!